Wine is a recursive acronym for "WINE is not an Emulator" and is designed to run on Linux, software, which run natively only on windows. Specifically, Wine implements the Win32 API (Application Programming Interface) library calls thus one can do away with the Windows OS as such. In the past, I have successfully run Photoshop, MS Word and a few Windows games in Linux using Wine. At times, I have noticed a remarkable performance improvement while running a particular software using wine when compared to running it on windows. 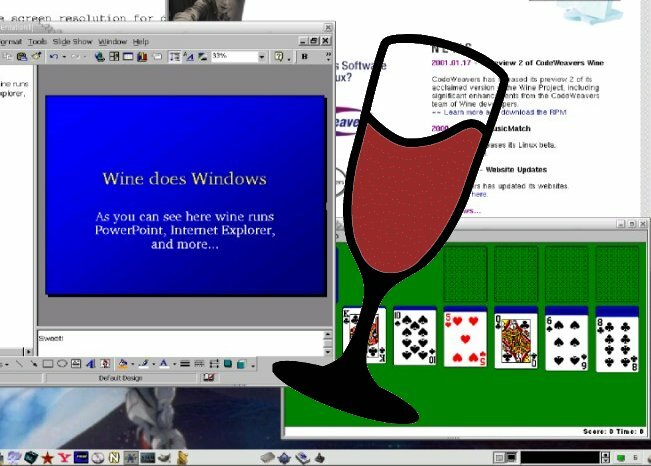 Now Tom Wickline has posted the results of the benchmark tests he carried out comparing Windows XP and Wine. The results are rather interesting. Out of a total of 148 tests conducted, Wine leads in 67 tests which includes texture rendering, OpenGL, virus scanning, Memory tests and CPU test suite. And not surprisingly, Wine lags behind Windows XP in the graphics test suite which uses DirectX instead of OpenGL. If you are tech savvy and would like to see the finer details of the tests, then you should possibly read the benchmark details. It's recursive, like Gnu is Not Unix. Wine is actually an application layer. Thanks for pointing it out. I have changed it accordingly. Capitol/bold letters on the first word of each letter with the exception of "an" ..